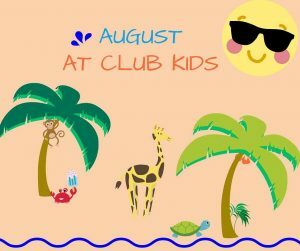 You can always count on your kids having fun at Club Kids while you're working out - see what's happening in August! This week our theme at Club Kids will be DINOSAURS! We will have our usual crafts and explore dinosaurs & "fossils" in the sand tub. We'll have our dino-size work outs and read lots of How Does a Dinosaur books. You don't want to miss out on a 'DINO-mite' week of fun! The Olympics are underway and Club Kids is getting in on the excitement! Bring the kids by Club Kids this week for Olympic-themed crafts, sensory & LOTS of exercises. We hope to see you all here! Club Kids is in a Construction Zone this week! Bring your little ones by for construction-themed crafts, books, sensory play, work outs & more. We need more workers - hard hats provided so stop by for a good time! Club Kids will be closed Aug 22-Aug 26 and Aug 29-Sept 2. They will be open both Saturdays, Aug 27 and Sept 3. Click here for all the details about Club Kids daycare located in the DAHLC subway and available for members' use.